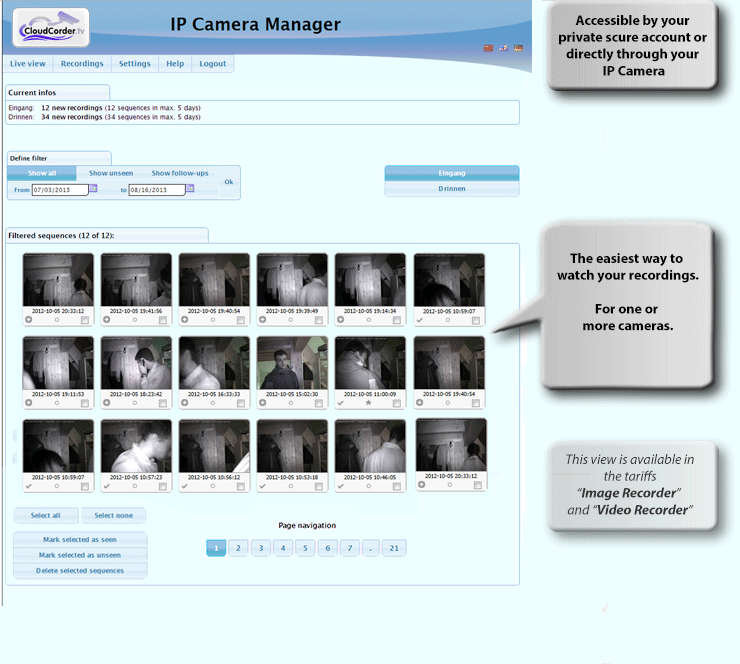 Free IP Camera Manager for Live-Surveillance of all your cameras. Including free Camera Manager for monitoring all your cameras! Automatically takes snapshots as soon as anything starts to move in front of your camera and stores it safely in our data center. (*) All prices are inclusive of taxes. Native Push-Messages are available in the tariffs "Picture Recorder" and "Video Recorder"! Our offers have nothing to hide. Also available as App "CloudCorder"
This feature can record videos and/or images - without any additional devices. It helps you to secure your home, your business, your warehouse, in an easy and inexpensive way, using a secure and convenient service to record videos and/or images of movements in front of your cameras. After activating the recorder, you will be able to view your recordings anywhere at any time through the internet. Additionally, the IP Camera Recorder provides a Manager-Account to you for monitoring / live-viewing and controlling all your cameras. Click on "See our offers" and you can set up your recorder in less than 5 minutes. The recorder provides an intelligent motion detection, so you will receive less false-alarms.